Deferred Buffers enables rendering of the material into the deferred buffers. 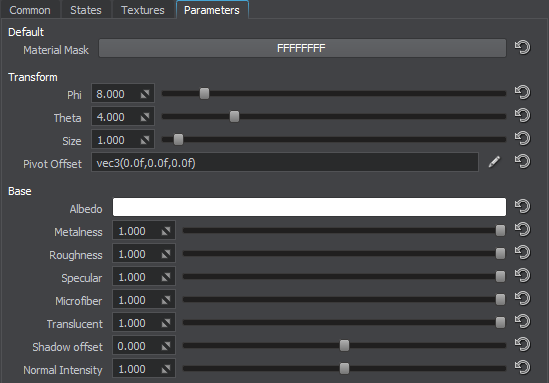 If the material is transparent, it doesn't write information into the deferred buffers by default. Enabling this state for a transparent material allows this material to write into deferred buffers and, therefore, to participate in post effects. Microfiber Map enables using of the Alpha channel of the shading texture that stores the microfiber texture. Sun Shafts simulates visible volumetric shadows, arising when a bright world light source is partially obscured by the object. Normal texture. 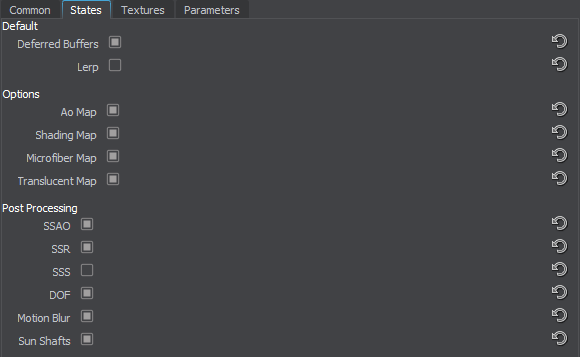 To create a normal texture for impostor, use Impostors Creator tool: the texture will be set automatically after generation. Material mask is a decal bit-mask. If the material mask of the decal material matches the surface material, the decal will be projected onto it. Microfiber is a coefficient to scale the intensity of the microfiber (provided by the microfiber texture). The higher the value, the higher the microfiber texture effect is. Normal Intensity is a coefficient to scale the intensity of the normals (provided by the normal map). The higher the value, the higher the normal texture effect is.